Combinatorial chemistry can be traced back to the 1960’s, but didn’t gain popularity until 1990 when pharmaceutical companies started compounding large amounts of potential new drugs into libraries. Combinatorial chemistry has moved into other disciplines such as materials science, biotechnology and even semiconductors. Because combinatorial chemistry requires multiple samples to be run in parallel, Labconco’s new RapidVap® Vertex Evaporator, which accommodates up to 50 samples, is the perfect evaporator for this unique type of R&D. During parallel synthesis, each product is synthesized in separate reaction vessels. The advantage of parallel synthesis is that the composition of each compound is known, but generally, the split and mix procedure can generate many more compounds in the same amount of time. The samples are evaporated in the Vertex simultaneously which speeds throughput and keeps all samples under the same conditions. The nitrogen supply is controlled in rows of 10 so nitrogen can be conserved in smaller sample runs. 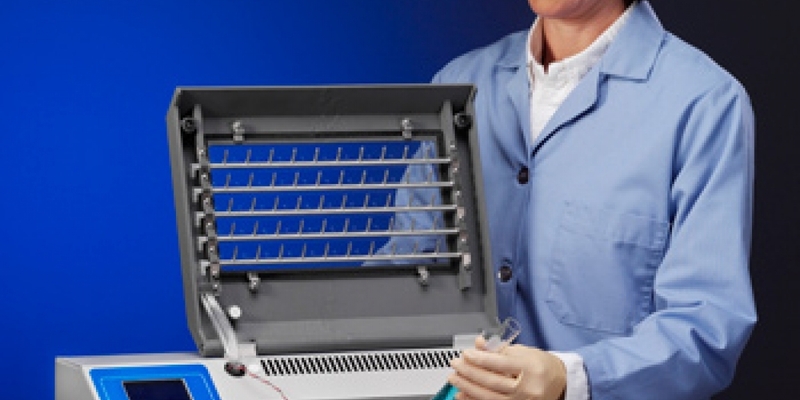 The RapidVap® Vertex Evaporator uses a dry heat block to quickly evaporate samples under a gentle stream of nitrogen. Unlike water baths, a dry block does not evaporate during the run which can result in causing condensation from the bath to drip into the samples causing contamination. The RapidVap Vertex accommodates tube sizes ranging from microcentrifuges up to 28mm in diameter. Ten user set programs are available so you are assured the same parameters are used for each run. This gives reproducible results no matter who is using the Vertex. Please find out more about our entire line of RapidVap Evaporator Systems.